E kore ahau e tu mokemoke, ko nga tuituitanga, a tai, a awa, ki etahi ano o nga maunga, e mau nei ki te toka maru. I (Pirongia) do not stand lonely and alone. I am bound by the tide (Kawhia) to the rivers (Waipa and Waikato) and to other mountains (particularly Karioi and Taupiri), strong and unmoveable. Pirongia is an eroded volcano which rises out of the gentle rolling Waikato countryside south of Hamilton. There is a choice of numerous tracks to the summit, with the most popular Corcoran Rd route taking between 3-5 hours on the ascent. If you enjoy Pirongia’s beauty, please consider supporting the excellent work of the Pirongia te Aroaro o Kahu Restoration Society by sponsoring a hectare of Pirongia. This will help return Pirongia to a complete living forest, and will assist with pest control and track cutting. 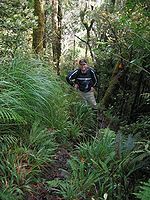 The Pirongia te Aroaro o Kahu Restoration Society website also provides comprehensive information on Pirongia’s history, geology, flora, and fauna. From the end of Corcoran Rd, the Tirohanga track heads up to the rocky knoll of Ruapane summit (723m), which provides a lookout across the Waikato. Allow one hour to reach Ruapane from Corcoran Rd. From here the going gets harder, as you will need to navigate some rocky sections with the assistance of chains. 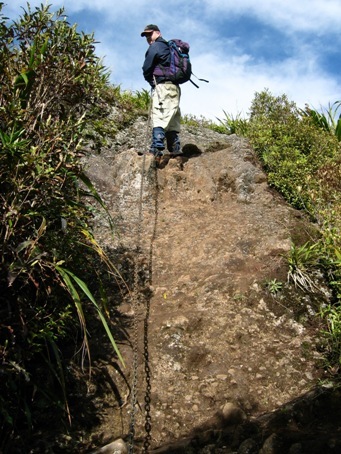 The track then narrows along a ridge, and you will pass the the rocky pinnacle of Tirohanga. The track in this section is of tramping standard with tree roots and mud. The upper section of the tramp gets steeper before you reach boardwalks which take you across muddy sections just before the summit. At the summit there is a viewing platform – this allows you to get above the forest and see the panoramic views across the west cost harbours of Raglan and Kawhia, and possibly to Ruapehu and Taranaki on a clear day. On the lower slopes the forest is predominately rimu, totara, tawa and tree ferns. Higher up, the forest changes, and you will see hardier plants like kamahi and horopito, and mountain flax, coprosmas and ferns near the summit. Keep an eye out for native birds, as grey warblers, fantails, tomtits, pippits, harriers, kingfishers, New Zealand falcons, kereru, tui, bellbirds and whitehead can be spotted in the Pirongia Forest Park. See the Pirongia Forest Park DOC brochure for more information and maps.